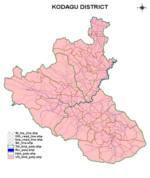 Cadastral level GIS for Kodagu District. This project is being carried out for the Center for Environmental Education. It involves preparation of cadastral level GIS database for entire Kodagu district of Karnataka state Read More . .
Cadastral Level GIS for Entire Bangalore Metropolitan Area. This Project was carried out for SCE as a part of the revision of the Comprehensive Development Plan of the Bangalore Development Authority Read More . .